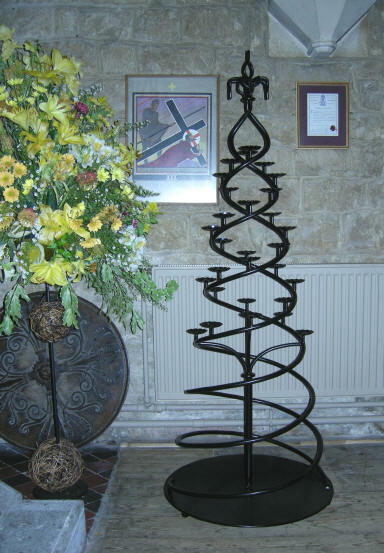 Peter Carpenter, a local craftsman specialising in wrought iron work. It depicts the structure of part of a DNA double helix, the ‘thread of life’. St Nic’s – on the road! I was walking in Warwickshire several years ago when I came across a neatly painted sign beside a broad track: ‘Choose your rut carefully,’ it said, ‘you’ll be in it for a long time’. I love this kind of humour, so often popping up in odd places: glimpses of humanity in a world that seems increasingly regulated and standardised. One of the joys of walking (and, I am discovering, of cycling too) is that occasionally you can escape the constricted routes along which you are forced to travel by car. New and hidden ways open up, such as the rugged path between Swindon Village and Elmstone Hardwicke, where tall, ancient hedgerows lead you between fields and even on a weekend you can experience real solitude. One of the consequences of our highly developed society is that we are losing touch with wild places1. When human beings first came to these islands it was they who had to find a place amongst the wildwoods. Even a few hundred years ago much of this country was wooded, and there are not a few alive today who remember fields and hedges where now there are houses and businesses. The wildwood still holds a place within our imaginations and is the setting for so many of the stories we tell our children. It is a reminder, hidden in the recesses of our unconscious, that we are created, for ‘God breathed life into the earth creature and he became a living being’2. We have been steadily losing our sense of the seasons too3: the subtle differences between early, mid- and late summer, the gentle but perceptible shift through autumn towards winter. A culture whose life used to respond to the turning of the earth now follows other patterns: the academic year, the fiscal year and (perhaps the most soul-destroying of all) the sales. I have never yet heard anyone express pleasure that the run up to Christmas begins in mid-September, and yet as much as we complain we seem also to accept this strange unseasonality as if it is inevitable. One of the strongest messages of the Christian faith is that we are not victims of society, compelled to go with the flow. Rather we are called to take responsibility, first for our own lifestyle and then, by extension, for the world in which we live. The teaching of Jesus points us to a prayerful and intentional way of living that not only pulls society in a different direction but also prepares us to face resistance4. He also reminds us that he is at work wherever people are, and that the task of believers is often simply to recognise what he is already doing5. One of the many gifts of prayer, that intimate communion with God that connects us to what is essential, is that it enables us to discover and choose life-affirming, life-giving ways so that the rut, rather than controlling us, becomes something we create and shape, our gift to ourselves, our society and those who come after. Two examples in the past year are Mark Boyle from Bristol, who lived without using any form of money for a year, and the Beavan family of New York, who attempted to live as a ‘no impact’ family. One evening in early September a small number of people from the churches in our Team accepted the challenge of exploring how we might ‘double the congregation in a day’ on Back to Church Sunday later in September. We took part in an Invitation Workshop, sharing our own stories about who first invited us to church and suggesting reasons why members of the congregation hesitate to invite their friends to come along. Are we embarrassed or don’t know what to say? Does previous lack of success discourage us from trying? Are we worried that our invited friends might not enjoy themselves? Do we feel that being on the rota to serve, or to help with the Junior Church, would prevent us inviting someone to come on a particular day? Dave Walker cartoons, familiar from the Church Times, offered amusement and tongue-in-cheek suggestions to help overcome our reluctance. Having begun with invitation, we moved on to think about what it means to be a welcoming church before, during and after the Service, and beyond Sunday. We also reflected on what it means to be ‘Church’ in 2010. Perhaps you invited a guest on Back to Church Sunday. It takes effort to transform a stranger into a sister or brother. Did you assume they would come the following week? Invite them to come again and make them welcome … again and again and again. By popular request we have booked another Team weekend at Sidholme in Sidmouth, Devon, from 23rd to 25th September 2011. These weekends are great opportunities to relax, have fun, enjoy one another’s company, meet new people from across the Team Ministry and take advantage of the fantastic facilities that the hotel has to offer. These include very good standard accommodation, excellent food, beautiful grounds and an indoor heated swimming pool. It is also a short walk from the sea! The weekend will include times of worship, activities and sharing in small groups, as well as an evening of ‘home-grown’ entertainment. The weekend is great for all ages – literally from 0 upwards – and if you have not been before but would like to know more, why not find someone who has been who can tell you all about it? You can also view photographs from previous years on this parish website or go to the website www.christianguild.co.uk/sidholme for details of Sidholme hotel. Prices range from £95 to £140 per person (reduced rates for children) and the cost of a coach will be extra. We have booked 120 places (the whole hotel) and need to send deposits now. Please complete one of the application forms which are available in church and return it as soon as possible to the Team Office or a Churchwarden with your deposit. Please make cheques payable to Prestbury PCC. There will be a Said Eucharist with commemoration of the departed at 10am in St Nicolas’ and a Sung Requiem with commemoration of the departed at 7.30pm in St Mary’s. Lists will be available in both churches for you to record the names of loved ones you would like to be mentioned. There will be an Act of Remembrance at St Nicolas’ during the 9.30am Sung Eucharist. In Prestbury village the Act of Remembrance will take place at the War Memorial at 10.45am followed by the Sung Eucharist in St Mary’s. At 3.30pm in St Mary’s there will be a Memorial Service. All are welcome to attend and invitations will be sent to all those who have been bereaved during the past year and whose relative’s funeral was taken by one of the parish clergy. The team of three, Paul Hodges, Dan Bartlett and Andy Wood, completed their 500 mile cycle ride on time with my husband Roger bringing up the rear in a people carrier loaded with luggage and spares and purchasing food supplies to feed the riders on route. They were cheered along the esplanade at Eastbourne, which they reached just as the annual air show was about to start. In Canterbury a can collection was held in front of the cathedral as Canon Condry, Canon Librarian of the Cathedral, welcomed them, and offered to join in on their next trip. 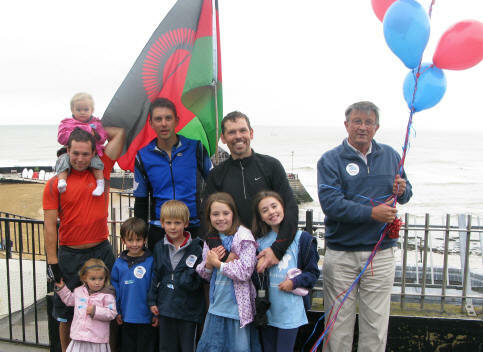 At Broadstairs parish church the Chairman of Malawi Association for Christian Support (MACS) met them amidst lots of balloons and in all the excitement Paul crashed into the back of Dan and buckled his front wheel, their only casualty of the 500 miles. The sponsored ride raised £3,780 which has paid for 1,289 mosquito nets, so with at least two people under each net that will deprive the Malawi mosquitoes of a lot of victims! The aim of MACS is to protect the whole population of 24 villages in the Zomba and Machinga districts of Malawi. Because this is the most effective way of malaria control 9,400 nets will be needed, costing £24,000. Our batch has been collected in the two MACS trucks but it was so big they needed to do two trips. The nets are now being handed out by the Macobo Community Based Organisation, a team of 120 volunteers who tend to health and practical needs on foot or bicycle. MACS is an independent Anglican organisation working in Malawi, responding to parish and community requests for help in their hospitals and schools. Their help is always given directly to the people needing it, thus avoiding any governmental or political involvement. Their Internet website is www.malawimacs.org, where a full account of their various projects can be found. It is fascinating to see what we can do, in our own very modest ways, to make quite a big difference in the lives of fellow human beings. Each summer St Nicolas’ choir have a hiatus during August. This year, for a change, Jeanette, Ron and I decided to visit each of our sister churches on four of the Sundays in August. This is the story of our journey. We enjoyed our visit to St Lawrence. It is a pretty little church, with an unusual six-sided tower. It was a lovely sunny day, and the sun was coming through the large stained glass window. There were few people there but we were made very welcome, and it was nice to have Father Paul officiating. The service was somewhat different from what we are used to, as they were using the Book of Common Prayer. This meant words that we don’t usually see, plus fewer hymns. There was no choir, although they could have been having a hiatus too! Two of the hymns were unknown to us, but Father Paul did not tell everyone we were from St Nic’s choir until the end of the service, so no-one noticed that our singing was a little hesitant at times! As we were leaving, someone suggested that we had t-shirts printed with our ‘tour dates’ on the back – which is what gave me the idea of keeping this record. 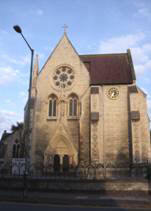 Both Jeanette and I have sung at All Saints’ before, in the choir, but it’s very different sitting in the congregation. In the choir stalls, you feel very enclosed and somewhat isolated from the congregation. Sitting in the main body of the church, you realise that it is huge, very ornate and has lots of things to look at. There were about twenty people in church, sitting scattered around the pews, but it felt ‘busy’. Again, some of the hymns were unknown to us, but with a tune we recognised, we were able to keep up without too much trouble. The incense made us cough a little – we’re not really used to it! At the end of the service, we were taken by surprise by the singing of the Angelus, which we are not so familiar with at St Nicolas’. We finished our visit with a cup of coffee and a brief chat with Father Stephen. The church is charming. It was another sunny day, and the church looked and felt very welcoming. As we entered, we met some old friends from last year’s Sidmouth trip, so some catching up was in order. Father Mike French was officiating and was his usual amusing self. The hymns were all familiar to us, so we were able to join in with confidence. At the end of the service, we had coffee and home-made cakes, and a chat with everyone who was in church (everyone stayed for coffee). Whilst chatting, we reminisced about Sidmouth, and realised that a lot of us have already signed up to go again next year. A bit nearer to home for our final week. We are all familiar with the church, but realised that we have only attended joint services before. Father Michael was officiating, and Deacon Jennifer gave a very interesting sermon. We were surprised to see the choir, as we assumed they were having a break during August as well. The hymns were all familiar, as was the order of service. The church was quite full, and we recognised most of the faces, even if we could not put names to them all! To finish off our ‘tour’ of the team, we attended the Songs of Praise at Elmstone Hardwicke. The church was full, and there seemed to be a good representation from all churches in the team. It was good to sing hymns that we were all familiar with, and luckily, for those whose words we didn’t recognise, the tunes were familiar so we could still join in. Father Michael and Neil Jones, a Reader, told us a little about each hymn, and who had requested it. There was a small group of musicians playing, which made a change from just hearing the organ. All in all it was a very enjoyable evening and one that we hope will be repeated at other churches in the group. Back to St Nicolas’ next week. We have enjoyed our road trip – but it will be good to go ‘home’! 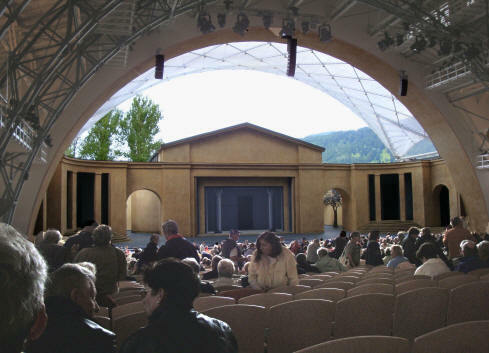 Oberammergau has many painted houses, two churches, a hillside Calvary (crucifix, Mary and John) and a small museum. The RC church of S Peter & S Paul is in the 18th century Rococo style. An evening display in the dark church made use of its many statues to tell the story of the Passion, various figures in turn being spotlit. However, a small ‘Jesus on the donkey’ on a stand had had to be added to the permanent furnishings. The 20th century Lutheran Holy Cross church is rather austerely furnished but has a fine crucifix behind the altar. The King of Bavaria provided the Calvary after attending the 1871 play. The museum displays many old play costumes, showing variations in presentation, but gave only token mention to the schoolmaster who wrote most of the music in use since 1811. The play itself interleaves the evangelists’ account of the Passion with choral meditations and tableaux vivants showing Old Testament parallels. A little distractingly, real animals were used: Herod himself rode a horse but his entourage included two camels. But the lions in the tableau of Daniel were probably not real! There were huge crowd scenes including children. Our hostess herself and her three-year-old granddaughter took part. An older child grabbed the tribute coin after Jesus handed it back and disappeared into the crowd with it, to the annoyance of Caiaphas. Caiaphas was utterly unscrupulous and manipulative. He was portrayed as having deceived Judas about his intentions, making Judas both victim and betrayer. The pro-Jesus faction in the Council was made quite strong. In addition to Joseph of Arimathea and Nicodemus there was one Gamaliel – can this have meant the Gamaliel with whom Paul is said to have studied? Pilate was wonderfully acted, showing a Roman contempt for a subject people. His famous line ‘What I have written I have written’ was transferred to Captain Longinus as ‘What the governor has written stays written’. This avoided bringing Pilate to Golgotha or shifting scene to bring a deputation to his palace. Little was seen of Mary apart from at Golgotha and an attempt to dissuade Jesus from remaining in Jerusalem. Mary Magdalene probably had more lines than Mary, for she was often added to scenes with the twelve. At the Last Supper there was a different addition: one of the twelve gave some of the Bread to the two servants attending the meal – a gesture of inclusiveness. Barabbas was a highwayman rather than a political insurrectionist, which might be why Pilate expected the crowd to reject him. The scourging and crucifixion scenes showed how cruel these punishments were. Indeed, our hostess said her grandchild needed reassuring it was only acting. Jesus’ body was carried off stage to an unseen tomb but the women returned on stage to report finding it empty. Mary Magdalene’s encounter with the angel was also on stage. When the eleven had been fetched, everyone filed off upstage with candles. And with light being borne to the world, the play ended. Five months after the latest General Election and still the political leaders are hitting the headlines. It is hard to forget these leaders, but how about our church leaders? More especially those leaders who spoke the word of God to us. Who are they, or who were they? Do we remember them? We are encouraged to do this in these two verses from the letter to the Hebrews. Do we thank God for them and for the part they played in getting us to wherever it is that we are today on our personal spiritual journey of faith? What was it that made you take note of what they said? Was it their manner, accent, appearance or way with words that struck you? Or did you respond to the setting, the place, the atmosphere? You may have been influenced by their words not only because they spoke the word of God but because they also lived by the word of God: lives transformed by God’s amazing grace. Doubtless we all have experience of words proved hollow since they were not reinforced by a genuine life in which the same principles were lived out. Obviously Jesus is our primary source and example, but since he is no longer physically with us in human form then leaders take the baton and inspire and encourage us in our faith by the power of the Holy Spirit. Consider in what ways you are yourself a leader of some sort. Are you a parent with direct responsibility for your own child? Or a godparent or grandparent? Even when you consider the youngster may be in an uncommunicative or otherwise disagreeable mood the child in them still subconsciously looks to you for a lead. Do you have responsibilities for others at work or in a voluntary capacity? Then there are those who will look to you to give a lead. The commentary I looked at while preparing this spoke of much uncertainty regarding Hebrews. The author, the exact date of writing, the intended readers, are all uncertain. Yet despite this many Christians though the ages have found the contents to be of great spiritual wisdom and guidance. Continuing with this theme of uncertainty I find that the older I get the more uncertainty seems to impinge on my life. Uncertainty in the sense of unsought change seems to be one of the very few constants in life. Day by day a stream of new challenges present themselves with new ethical, social and economic issues in their wake while all around we see people uncertain as to a moral compass by which to live. So how wonderful to discover and hold fast to the truth expressed in verse 8. Jesus Christ – God with us, our brother, guide and saviour, remains unchangingly how we discover him in the pages of the gospels. A certainty. But not an excuse for complacency or hiding our collective heads in the sand. Ours is the challenge to prayerfully work out just how to share this good news in our here and now. This year our harvest gifts will again be going to Cheltenham Open Door. They will be grateful for non-perishable goods in tins and packets, including general household items and toiletries. We would welcome some assistance in transporting the gifts to the charity later that week. Please speak to a churchwarden if you can help with this. Our bakestall in September raised £40, and from the previous one in July we sent £50 to Let the Children Live! and £20 to Everychild. The next bakestall, to be catered for by the A-F team, falls on Sunday 17th October. All proceeds to Let the Children Live! Would you enjoy a pleasant afternoon out instead of the evening now that the darker and colder days are fast approaching? If so, why not come along to the Prestbury Home Economics Group? We meet in the WI Hall on Prestbury Road on the fourth Monday of the month, usually at 2.15 pm. There is no Annual Subscription and you do not need to be a WI member, just £1 each time you attend. Our next meeting will be Monday 25th October starting at 2pm due to it being our AGM. This will be followed by a Make-up Demonstration given by Kristi from Beauty Beyond of Winchcombe, followed by tea and biscuits. The following two meetings are ‘I was a Butlins Red Coat’ and ‘My Mother was a Cockney’ and we are currently arranging what we hope will be interesting speakers for next year. Do come along – you will be sure of a warm welcome. This month’s Mothers’ Union meeting is on Tuesday 26th October at 7.30pm at St Nicolas’ Church, when the speaker will be Kate Thompson on the subject of a Diocesan Mothers’ Union visit to India. All are very welcome. There is another opportunity to join the congregations of Swindon Village and Elmstone Hardwicke for their Songs of Praise-style evening service on the fifth Sunday of October. Evening Praise will be at 6.30pm on Sunday 31st October in St Lawrence’s Church, Swindon Village. All are welcome. Evening Prayer at St Mary’s and Choral Evensong at All Saints’ will also take place as usual that day, and you are, of course, welcome to those services as well! Thursday 4th November 10.00am–3.00pm at Salem Baptist Church, 129 St Georges Road, Cheltenham GL50 3EQ (Bus route D, stop ‘Spirax Sarco’). We shall be holding a ‘Roast Pork and Apple Pie’ party on Saturday 6th November in the Prestbury Hall in Bouncer’s Lane. We hope as many church members as possible will be able to join us. This will be an opportunity to meet members of the wider Prestbury community who are not regular churchgoers but who have responded nobly to the call to provide financial support for the upkeep of the church and churchyard. To date the Friends have contributed a total of £17,200. Tickets for the ‘Roast Pork and Apple Pie’ party are £7.50. These are available from Phil Dodd or Jim Mackie. I am sure many of you will have noticed how well the churchyard has been kept this summer. Thanks must go to the regular band of mowers who work hard keeping the churchyard so well kept. To assist the regular team we would like as many additional helpers as possible to help tidy the churchyard before winter. It is planned to have a churchyard tidy up on Saturday 13th November. Help will be needed to gather up all the fallen leaves, clear gulleys and generally tidy up. Any time anyone can give to these activities will be greatly appreciated. This year’s Christmas Tree Festival in Swindon Village in aid of St Lawrence Church Restoration Appeal will be held over the weekend of 4th & 5th December and we would welcome entries from groups and individuals. This year’s theme is ‘A Pantomime or Christmas Show’. Entry is free. Admission to view the trees will be £2 for adults and there will be a small prize for the entrant of the most popular tree as voted for by the visitors. This will be our fourth festival and we hope it will be as successful as the first three. It makes a magical start to the Christmas season. Please contact Karen Evans if you are considering entering. Please speak to one of the clergy if you would like to consider joining a confirmation preparation group. This group will begin meeting in January in preparation for a confirmation service in Gloucester Cathedral on 7th May 2011. Thank you to all those who were involved in the Prestbury Parish Fête last month. It was a fabulous afternoon with tremendous support from so many people and a real sense of ‘the church’ connecting with its local community. Special mention to David Lyle and the North Cheltenham Churches football team, who had erected the tents by 9am and then stayed to man the Pig Roast in the afternoon. We raised £2,100 for church funds! A group is meeting to plan the creation of a Prestbury Local History Society building on the work of the informal Prestbury History Group which has been meeting until recently. At present this is at the discussion stage but please get in touch if you wish to contribute. Contact Michael Cole or Norman Baker. Watch this space!